Once again, it is time for Christian Audio's free download of the month! "The Divine Comedy is a true literary classic. Dante's poetic masterpiece is a moving human drama. An unforgettable visionary journey through the infinite torment of Hell, up the arduous slopes of Purgatory, and on to the glorious realm of Paradise - the sphere of universal harmony and eternal salvation. Pam Ward narrates warmly and thoughtfully as she clearly and capably walks the listener through the unfolding drama." 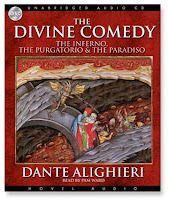 All you have to do is add the download format of The Divine Comedy to your cart and enter coupon code AUG2009 when prompted during checkout. continue reading "The Divine Comedy"